We know that social media usage is migrating to mobile, but how much of that usage is channeled through apps, and how much is through browsers? Facebook reaches about 76% of the U.S. smartphone population through its popular app, according to recent data from comScore. But an additional 10% of smartphone owners access Facebook only through the mobile Web (using a mobile browser such as Safari or Chrome). 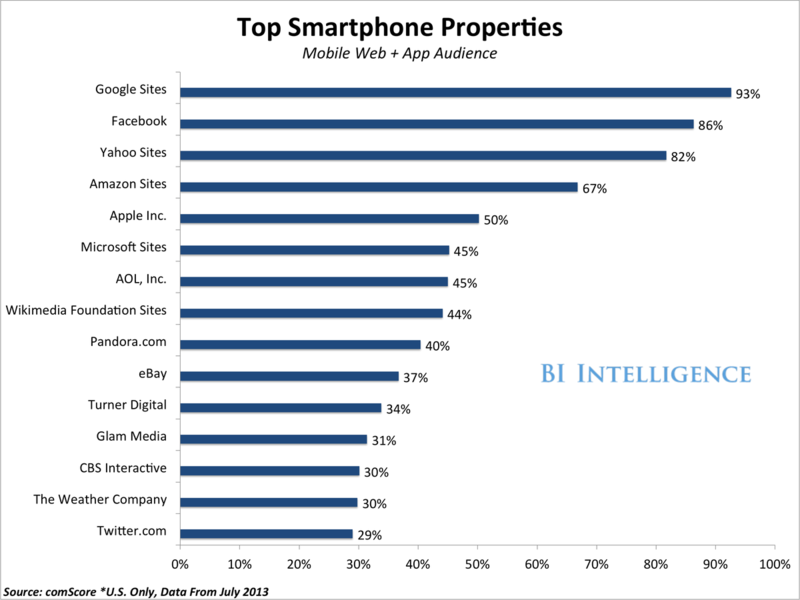 In other words, Facebook sees a 13% gain in audience thanks to its mobile website. Twitter is even more dependent on the mobile Web. Twenty-one percent of the U.S. audience accesses Twitter’s app, but an additional 8% access it over the mobile Web. That’s a 38% audience “lift,” taking the app-only audience as the base, for Twitter. 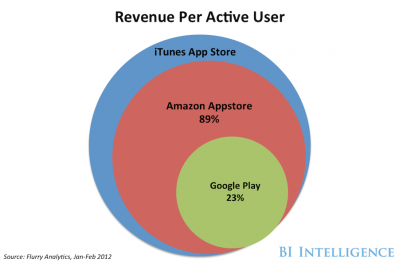 Pandora is 100% dependent on its app usage. Looking at the top smartphone properties, one interesting case is Amazon, which reaches an impressive 66.8% of U.S. smartphone users. ! However, it fails to crack comScore’s top 15 apps list, meaning its app fails to reach the thresh hold of reaching 20% of smartphone users. Amazon is clearly still dependent on the mobile Web browsers for a big chunk of its audience. It may be true U.S. mobile users are quickly moving away from the mobile Web in favor of apps, but developers and app publishers need to keep an eye on their mobile sites too. From the moment Amazon was founded more than 15 years ago, Amazon’s management has chosen to invest aggressively in the long-term future, instead of fretting about maximizing quarterly profits. As the chart below shows, for more than 15 years, this decision has reduced, deferred, and even eliminated near-term profits. 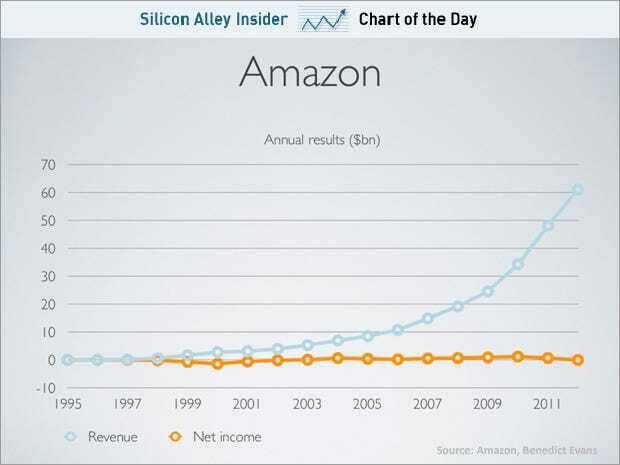 And yet, over the past 15 years, Amazon’s stock has delivered extraordinary returns. People learned to spell Blu Ray correctly (without the “e”) but this media format is already in decline, being replaced by video streaming through services like Netflix, Hulu, Amazon, YouTube, etc. 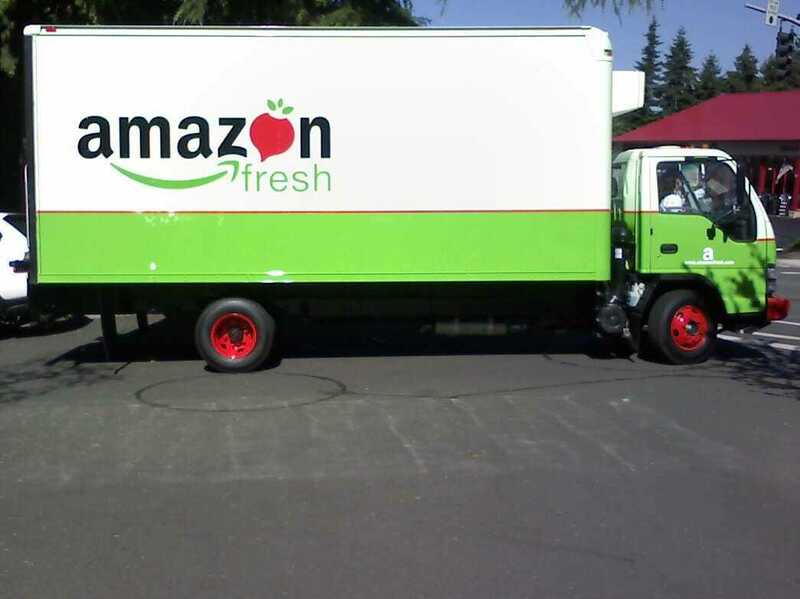 Amazon is becoming a force within the digital ad market, with revenues growing 45% last year. This year, eMarketer estimates Amazon’s ad revenues will top $835 million, as the company benefits from its vast consumer purchasing data.